Thus is the kingdom of God; as though a man should cast seed into the earth, then sleep and rise, night and day, and the seed should sprout and grow without his knowing it. For of itself the earth bears the crop, first the blade, then the ear, then the full grain in the ear. But when the fruit is ripe, immediately he puts in the sickle because the harvest has come. I have often said that one of the most rewarding tasks I do as a teacher is sweep my classroom floor. Why? Because cleaning my classroom is one of the very few labors I do as a teacher and a priest wherein I can see the immediate results of my work. I can look down at that dustpan and take satisfaction in seeing all the dirt I got off the floor. Not so with teaching. Not so with being a priest. When it comes to laboring among minds and souls, we do not always see the fruits of our work. I think this is one of the points Jesus is making in Mark 4:26-29. Our Lord compares the growth of the Kingdom to the sprouting of seeds. Seeds do not always spring into life immediately, and sometimes they germinate under the strangest conditions. If there is any gratification in sowing the Word of God, it is delayed gratification. I want to give you four illustrations. (1) In 1922, when archaeologists broke into the tomb of Egypt’s King Tutankhamen, they found a bowl of wheat beside the head of the mummified monarch. One of the scientists took some of the grain and planted it. Guess what. After more than three thousand years, it sprouted! Talk about delayed gratification! I am, at this moment, thinking about my mother. She married my Buddhist father in 1948. Through all the days of their marriage, not a single day went by that she did not pray for Dad’s conversion to Catholicism. My father did eventually take catechetical instruction and was baptized at the Easter Vigil in 1983—thirty-five years after his wedding! The seeds of the Gospel that Mom began to plant by prayer and example, even before she married my father, ultimately bore fruit in Dad’s reception into the Catholic Church. Seeds take time to bear fruit, some more than others. (2) The Jack pine of Canada’s boreal forest produces resin-filled cones, which are able to open and release their seeds only in the intense heat of a forest fire. 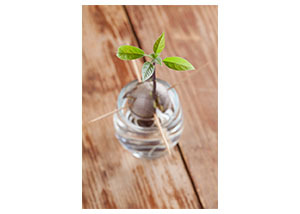 The saplings from these seeds are especially suited for growing in the ash-laden soil resulting from the conflagration. In other words, these trees can reproduce themselves only in the seeming tragedy of a fire. At all other times, their power to multiply lies dormant. Sometimes the goodness planted in the depths of the human soul comes forth only, or primarily, in the midst of tragedy. After 9/11, we learned of the great heroism of the passengers aboard the jet that missed the Pentagon. I like to think that some of their greatness, some of the seeds of the Gospel even, lay dormant within them, waiting for this one moment of opportunity. Some seeds do not bear fruit unless stimulated by impending catastrophe. (3) Shortly after the horrific bombing of Hiroshima and Nagasaki in 1945, there sprang up an unprecedented abundance of wildflowers. Thousands upon thousands of flowers were stimulated into bloom by the radioactive fallout. The devastation of the bombing was covered over by a surreal kind of beauty. In the year 1013, there was born a man who later came to be known as Herimannus Contractus, or Herman the Lame. He was educated in the monastery of Reichenau, where he later took religious vows. He proved to be one of the greatest intellectuals of the Middle Ages. He wrote on a whole host of subjects, including mathematics, botany, astronomy, and chronography. Yet, as Father Benedict Groeschel says, Herimannus Contractus “had spina bifida, cerebral palsy, and a cleft palate so severe that he could not be understood.” As if all these crosses were not enough, he eventually went blind. What did Herimannus do in his blindness? He wrote prayers, antiphons and hymns. Many people believe it was he who wrote most of the hymn we know as the Salve Regina, that is, the Hail Holy Queen, the prayer we recite at the end of every rosary: “Hail Holy Queen! Mother of mercy, our life, our sweetness and our hope!….” Sometimes the most beautiful flowers spring forth from the soil of human suffering. (4) When I was in high school, I learned how to grow very beautiful ornamental trees from avocado pits. I remember I once planted an avocado pit in a large pot of soil. I tended and watered it week after week after week. Nothing appeared to happen. In a burst of impatient curiosity, I dug up the seed to see how it was doing. To my surprise, I discovered a vast system of roots. Unfortunately, my disturbing of the soil broke the plant’s major taproot, and all my dilligent efforts were in vain. There may be someone whom you love and for whom you are praying. You are waiting to see the results of your love and your prayers. All is apparently to no avail. Be patient. Saint James tells us (James 5:1-8) to be like the farmer who patiently awaits the produce of the soil. Saint Monica prayed seventeen years for her wayward son Augustine to embrace the Catholic Faith. There was a woman who was patient! Yet her tears eventually moved heaven itself and at last gave way to triumph. When it comes to planting seeds—the seeds of the soil or the seeds of the Gospel—trusting patience is a necessity. Remember the wheat in the tomb of King Tut. Like pinecones that open only during a fire. Who spoke of the flowers in ruined Nagasaki. Patience is key. Do not give up hope. Recall the avocado pulled up by a dope!